Two corviches with salad makes a filling lunch. One of the best things about living in Ecuador is having all the time in the world to discover the wonderful variety of delicious fresh food available all over the country. From exotic tropical fruits, unheard of vegetables, meats you didn’t even know you could eat, and an amazing array of seafood. On the coast, bananas feature in almost everything, from soups to salads, mains and side dishes, and also snacks. Bananas – especially the cooking varieties – are sometimes called “air potatoes” because they taste starchy and grow in trees. Corviche is considered a snack, but if, like me, you’re not fond of white rice, it can also serve as a good lunch. Split and filled with salad and mayo or chili sauce, you can’t beat a well-made Corviche. With its green plantain banana shell and rich albacore filling, it’s tasty, nutritious and satisfying. Corviche is Number One on my list of Ecuadorian favorites. Fresh albacore tuna is the best fish for this recipe, but you can use others too. First, prepare the fish sauce. Saute the onion and garlic in a pan and add the tomatoes. Let it simmer slowly for a 10-15 minutes before adding the fish. When the fish is cooked through, toss in the cilantro and mix it through. Turn off the heat and leave the sauce to cool. To make the salad, combine the cabbage, carrot and red onion and pour the lime juice over. Set it aside. Rub your hands in a little oil before you peel the bananas, so the sap doesn’t stick to your skin. Protect your clothing from the banana sap too – it stains black and doesn’t wash out. Peel and wash the bananas, then grate them with the finest blades so you end up with a doughy mix. Using your hands, blend in the peanut butter, achiote and salt until it’s well combined. With wet hands, divide the mixture into four and roll them into balls. In your hand, flatten out one ball, place a spoonful of fish sauce in the middle (don’t put too much or it won’t seal properly) and fold it over, sealing the edges with your fingers until you have a torpedo shaped ball. Repeat with the other three portions of banana mix and fish sauce. Traditionally they are deep fried for about 15-20 minutes. If you don’t want to fry them, you can bake or grill them, but they will come out slightly drier. Once they’re cooked, split the top and fill them with the salad. You can add mayonnaise, or chili sauce. My favorite is spicy home-made chili sauce. 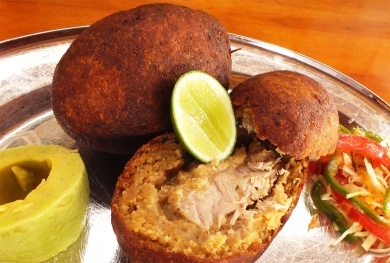 Would you like to learn how to make Corviche in Ecuador? Ask Footprints how. I was in Pedernales yesterday, way past lunch and staving.. dashed into a store and saw the corviche – yes! bingo! how could I have forgotten about corviche?! did a wordpress search tonight for ‘corviche,’ and here we are.. i’m so glad to find your blog! Thanks, Lisa… If you’re intereted, this year the cookbook “Going Bananas” will be released on amazon.com as a paperback and will also be available for sale as a traveler-friendly PDF. I’ll update this blog when that happens.